Our first Saturdays at the Flying Cat continue. Always a good time and you never know who may sit in with us. All ages and free! Back to my favorite spot in the San Juan Islands. This will be our first gig on the road this year. We love the venue and the beauty of Orcas Island! Due to the holiday we will move our First Saturday show to the second Saturday of January (this month only). See you there! First Saturdays at the Flying Cat continue. ARTB drummer, the mighty Sarah Linderman returns after a successful tour with Felina's ArrowYou never know who else might sit in with us on stage! First Saturdays at the Flying Cat continue. You never know who might sit in with us on stage! 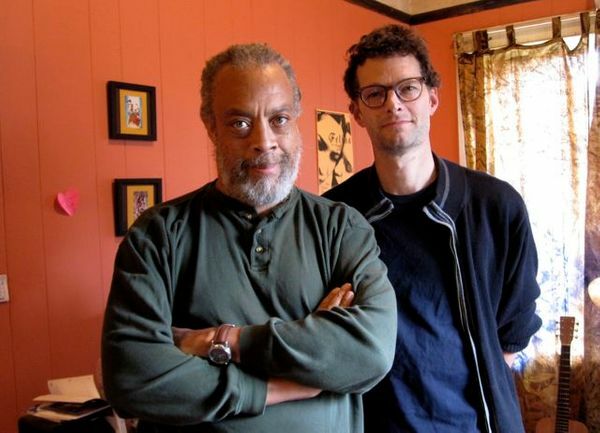 This month I will be joined by ARTB guitarist/bassist, the legendary Whit Draper (pictured with me above). I also expect that we may have a celebrity guest appearance as well. I am not gonna name names but I will say that if he does show up and you miss it, well.... Either way it will be fun. First Saturdays at the Flying Cat continue. You never know who might sit in with us on stage! I played here last year and it was a blast. Come up if you can. It's a great get away! It's the 5th annual Music Fest at Helsing Junction Farms in Rochester Washington. 3 days of music, film and organic food in the sun on the Chehalis River. August 21-23. I'll be performing on the main stage again this year along with a host of other original music practitioners. Our set is Saturday (Aug. 22) at 1pm. Thirty bucks gets you a pass for all three days including camping! Click here for a complete line up of performers and showtimes. Don't miss it!! Join us for the first in our series of "First Saturdays at the Flying Cat". Special guest Terese Carlton will be opening the show. 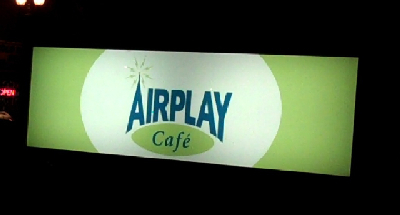 Airplay Cafe is a great location for listening to acoustic music. Family friendly. All ages. I'll be performing once again on the Sleepy Hollow Stage, Friday and Saturday nights for Fair Family. Hope to see you there. Watch my video report on last years Fair below. It's about 20 minutes long! I probably could have done a better job of editing:-) If you get bored, you can fast forward by clicking ahead on the timeline. If you have never been to the fair, this video will give you a taste. It's a reprise of our very successful summer solstice show from last year. 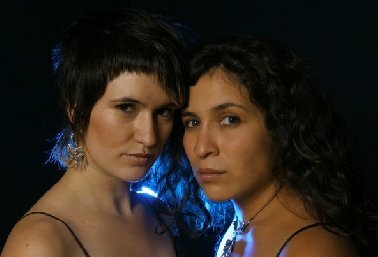 In addition to new songs from Alexander's Real Time Band, the show will feature the musical stylings of Felina's Arrow (pictured above). Help us celebrate the longest day of 2009 at Artichoke! 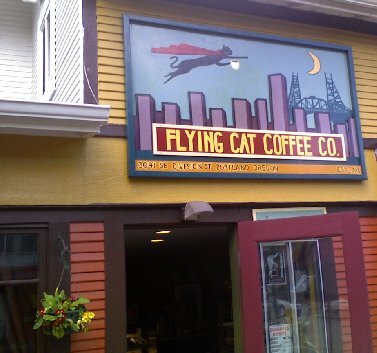 Join us for the grand opening of the Flying Cat Coffee Company! Joining Alexander's Real Time Band for this show will be the mighty Sarah Linderman on cajon and percussion and the legendary Whit Draper on guitar and bass. You never know who else might show up to sit in. 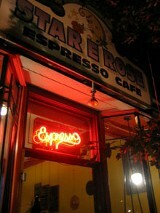 Join me for another 'Last Thursday' at the Star E Rose in the NE Alberta arts district. Great art, good food, music and a cast of characters; all the ingredients for a fun evening. I will be performing with the mighty Sarah Linderman on cajon and percussion. You never know who else may show up to sit in with me at this gig. 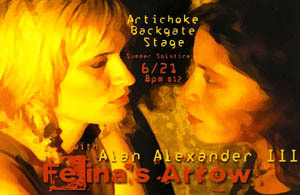 I will be opening for and performing with Felina's Arrow (pictured above) and the mighty Quadraphonnes. Sorry for any inconvenience !!! Join the fun at this singer/songwriter showcase. 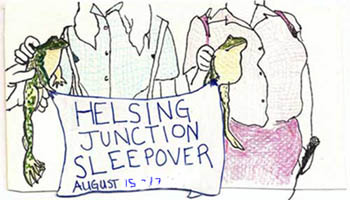 It's the 4th annual Helsing Junction Sleepover / K Records Music Fest. 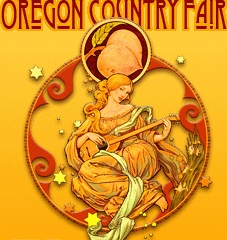 August 15-17 2008. 3 days of fun in the sun on the river and in the fields. Camping, Organic fresh farm food. Organic film. Organic music (over 20 musical acts, including yours truly). Who could ask for more? Click here for more info. For those of you lucky enough to have camping passes at this years Country Fair, please join me for a late evening show with the crew at Sleepy Hollow. The show will start about 9:00 after the Fair grounds are closed to the general public. It will be loads of fun. Join me and other area songwriters for original music in the round at Portland's coolest record store. 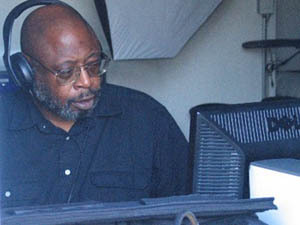 Please join us for a celebration honoring the life of Jeffrey "Sweet Lips" Dawkins. There will be sharing, music, a book to write farewell into and some momentos from Jeffrey's life to view. I will be performing with Whit Draper, Noah Peterson and others. dulce de leche womyn challenging social ideals. Join me for the first 'Alberta Street Last Thursday Art Walk' of spring ! !